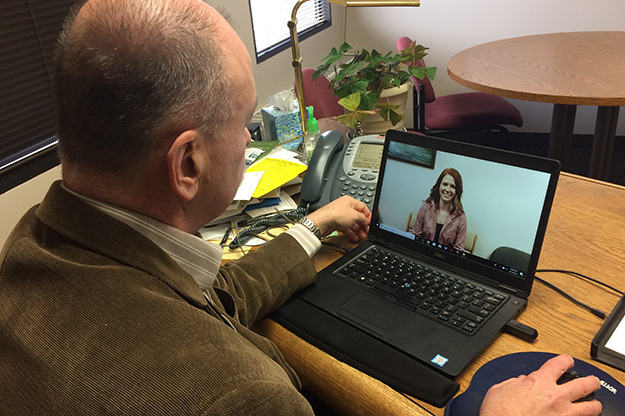 Andrew McLean, clinical professor and chair of psychiatry and behavioral science at the UND School of Medicine & Health Sciences, practices telepsychiatry to help reach patients in underserved areas of North Dakota. Photo courtesy of SMHS. Robert Olson is connected to western North Dakota. That’s one of the reasons the Williston native and fellow North Dakotan Andrew McLean are using technology to expand psychiatric services in the western part of the state. 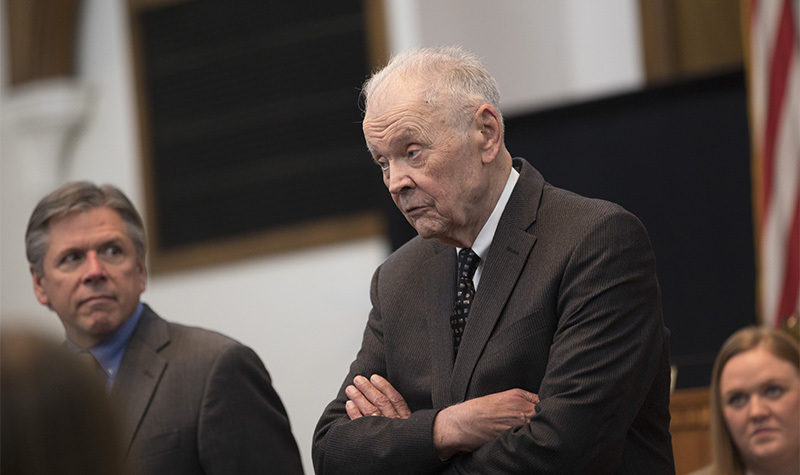 Psychiatrists are desperately needed to help combat addiction and psychiatric problems, especially in the oil patch and western North Dakota, they said. After the North Dakota legislature recently expanded the number of residency slots at the School of Medicine and Health Sciences through the Healthcare Workforce Initiative, the psychiatry residency program, which Olson directs, rose from four to six residents per year. At the same time, the SMHS began training those residents—who are stationed primarily in Fargo—to use telemedicine to reach rural areas and better serve the state. 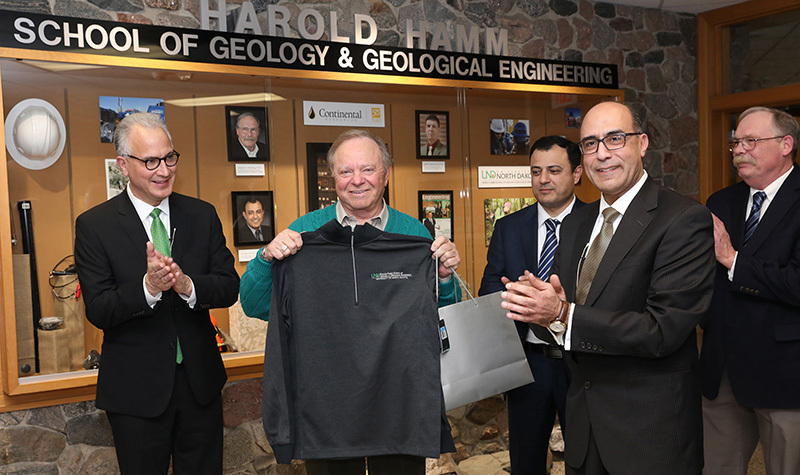 The initiative is part of the OneUND Strategic Plan Goal 4 Grand Challenges, help rural communities solve their unique health and social problems. Robert Olson, a geriatric psychiatrist who directs the UND SMHS residency training program in psychiatry, and Andrew McLean help psychiatry residents become comfortable practicing telemedicine. Photo courtesy of SMHS. “Telepsychiatry is clearly the wave of the future,” said Olson. 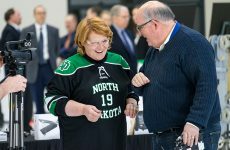 That’s important, said both physicians, because all of North Dakota benefits from better access to mental health treatment. 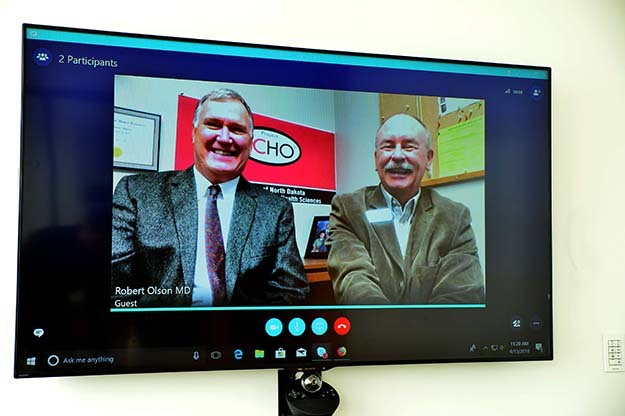 Telepsychiatry also exposes psychiatry residents to other parts of the state and may increase their interest in practicing there after finishing residency, McLean said. By combining rural outreach with telemedicine, the psychiatry residents also visit the communities and work with patients and medical providers once a month in person, then continue caring for patients using telemedicine every week. Patients travel less, and providers can still provide care, even in bad weather. Over the past two years, third- and fourth-year psychiatry residents have served Dickinson, Williston, Minot, Devils Lake, Jamestown and Bismarck, mostly at human service centers as well as with telemedicine, where their patients often have serious mental illness and addiction. “We were able to start the meds in person and provide follow-up with telemedicine,” McLean said. He added that the technology can help psychiatrists use time more effectively while improving the lives of patients. Olson said they receive good feedback from clinics and human service centers, along with patients and residents.